You start by planning and building your vacation itinerary. 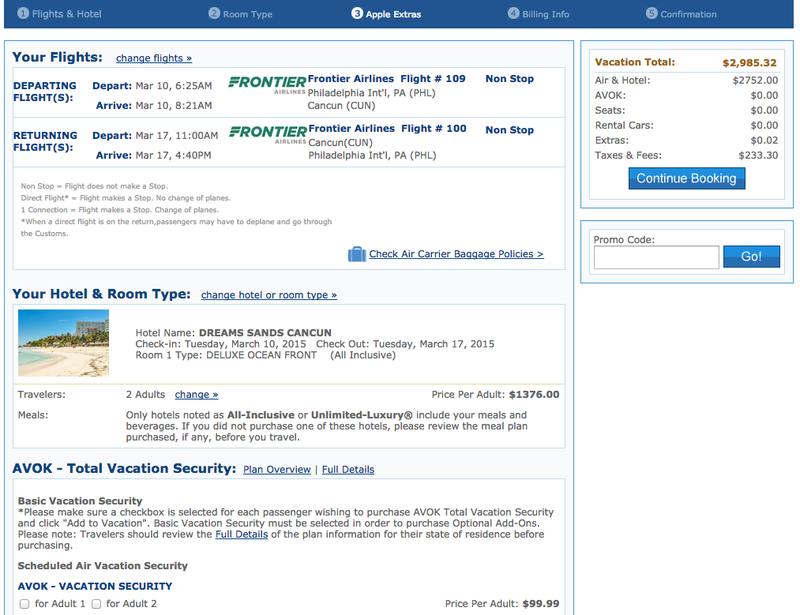 Once you’ve identified the vacation you want, the system will display an itinerary recap page, which looks like this. Simply take a screenshot of this page and e-mail it to us. We will respond to your email within 30-60 minutes with your discount amount. Please make sure to include your phone number when emailing the screenshot. While on this recap page, it very important that you don’t click on «continue booking», as it will ask you for payment and you will no longer be eligible for an instant discount. Once you receive our discount notification email, we will ask you if you want to proceed with making a reservation. If so, we will book your reservation and deduct the discount from the total. We then e-mail you a confirmation so that you can verify that all of the travel and payment information is correct. After getting your approval, we then e-mail you a secured credit card authorization web form so that payment can be made. Once payment is approved, we will send out a confirmation. This may sound like a lot of steps, but we assure you it’s not and can be done in less than 30 minutes. Plus, you get to save a lot of money! We recommend taking a screenshot of the itinerary page and emailing it. However, if you prefer to write out the details in an email, please make sure you include all of the following information as listed below. How is the 10% calculated? The 10% discount applys only to the hotel portion of the vacation package. There is a booking fee of $25. Does the 10% discount apply to special and square deals? What happens if I accidently paid online while planning my vacation? We will not be able to apply an instant discount, our system will not allow us to provide you with an instant credit. However, we truly care about your business and are more than happy to honor the discount. Checks are mailed out the week after you return from your trip. This is because Apple Vacations pays us our commission only at the time that you return from your trip. This is done just in case you cancel your trip. If you accidently paid for your reservation online, it is your responsibility to contact us and ask for the up to 10% discount check. There is a booking fee of $25.